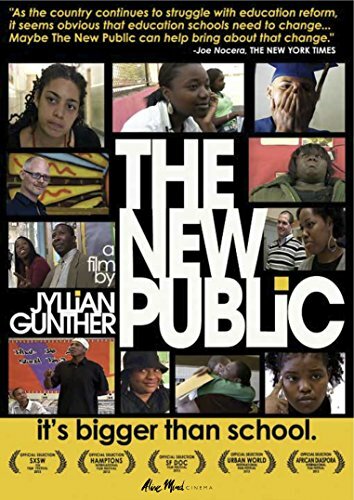 NEW YORK, NY - JANUARY 23, 2015 - Alive Mind Cinema is pleased to announce the DVD release of The New Public , a documentary by Jyllian Gunther that chronicles the first year of an inner-city charter school as the challenges of educating students in an economically-challenged system becomes daunting. This insightful documentary was an official selection at numerous film festivals, including SXSW, the Hamptons International Film Festival, SF Doc Film Festival, Urban World International Film Festival, and the African Diaspora International Film Festival. The New Public is set to street on DVD from Alive Mind Cinema on February 3, 2015, with a SRP of $29.95 and bonus features including the official trailer and The New Public on Colorado Public Radio. In fall 2006, former DJ, point guard and teacher James O'Brien opened a small public high school in Bedford-Stuyvesant, Brooklyn, where 1/3 of residents live below the poverty line and the graduation rate is 40%. With infectious optimism, O'Brien and his team of eight undertook an unconventional approach and ambitious mission: create a school with an arts-oriented curriculum that also emphasizes self-development, community collaboration and social change. Initially, the buzz from everyone was that this was a dream come true. But conflicts arose when untested idealism was challenged by long-standing realities far bigger than school. Specializing in documentaries in the areas of enlightened consciousness, secular spirituality and culture, Alive Mind Cinema seeks to provide audiences with intellectually provocative films that deliver the "aha" response of a transformative experience. Learn more at alivemindcinema.com. With a library of 1,000 titles, Kino Lorber Inc. has been a leader in independent art house distribution for over 30 years, releasing over 25 films per year theatrically under its Kino Lorber, Kino Classics, and Alive Mind Cinema banners, including five Academy Award® nominated films in the last seven years. In addition, the company brings over 70 titles each year to the home entertainment market with DVD and Blu-ray releases under its five house brands, distributes a growing number of third party labels, and is a direct digital distributor to all major platforms including iTunes, Netflix, HULU, Amazon, Vimeo, Fandor and others.